Minister of Labour and social security Joyce Simukoko says the country will soon have a new minimum wage. Mrs. Simukoko says her ministry has concluded negotiations to revise the minimum wage, which has been submitted to the ministry of justice. She says the minimum wage has remained the same for six years hence the need for its revision. Mrs. Simukoko has also urged unions to ensure they use workers contributions for the intended purpose. She says her ministry has received disturbing reports that some unions are misapplying workers contributions. 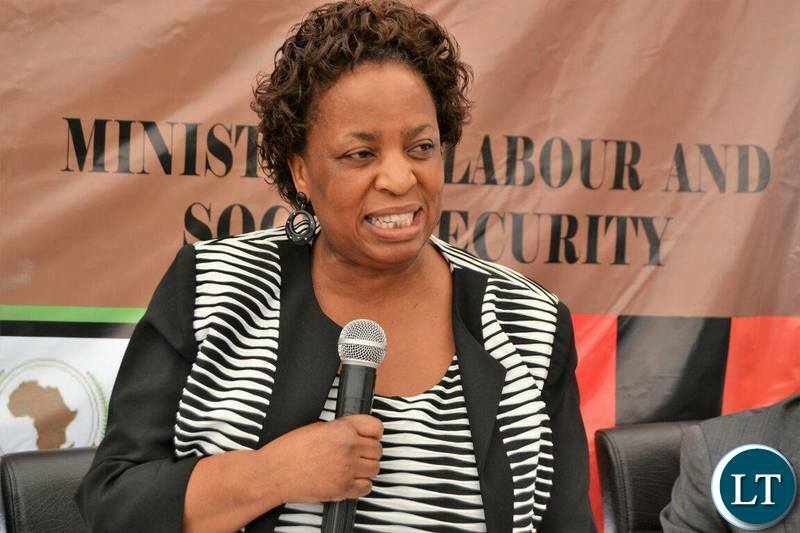 Mrs. Simukoko was speaking when she, in the company of the labour commissioner Chanda Kaziya and other officials from her ministry paid a courtesy call on the Zambia Congress of Trade Unions -ZCTU- management in Lusaka today. Mrs. Simukoko further urged ZCTU to engage in employee empowerment negotiations, because times have changed and negotiating technics need to change. And ZCTU secretary general Cosmas Mukuka said his union is committed to improving the welfare of workers by providing harmonised relations between the government, employers and employees. Meanwhile, National Union for Public and Private Educators of Zambia (NUPPEZ) in Chama District has urged Teacher Unions to work for the best interest of teachers. NUPPEZ Chama District Coordinator Lackson Lungu says unions get a lot of money from their members but do very little or nothing at all to benefit the members who contribute to them. Mr Lungu was speaking when he addressed teachers during an extraordinary union meeting held at Chama District Resource Centre today. He urged teachers to demand good representation from their unions adding that a T shirt or shirt at the end of each year cannot constitute teachers’ benefits. Mr Lungu stated that NUPPEZ is now a union of choice for many teachers because of it’s agenda towards empowerment of members. He sited land empowerment, cooperatives, revolving fund and the registration of a university as some of the innovations NUPPEZ had put in place to directly benefit its members. Mr Lungu also said NUPPEZ will never be silent on matters that affect teachers. During the event more than 20 teachers applied to join NUPPEZ. And all prices will go up and up and up again!!! Welcome to market forces according to the PF!!! What is the new bench-mark for USD? K12.50? K15.00? Of course, according to CSB, inflation will be usual 6-7%!!! You have destroyed not just the economy, but most importantly, future of the Nation. You madame are going to be the cause of a big redundancy as bussinesses are struggling already and all people will do is cut down the work force. you are the worst minister, I wonder why you are steal leading that ministry. infact you are suppose to be relieved of your duties. I PITY DOMESTIC WORKERS. THEY GET VERY LITTLE BUT IF MINIMUM WAGES ARE INCREASED MANY WILL BE MADE REDUNDANT. Stop fooling yourself. Who will look after your children when you and your wife go to your white collar job? Just be fair and pay them what they deserve. They work harder than you. Slavery was abolished almost 200 years ago in the rest of the world but it is still in existence in Zambia! All domestic workers are actually slaves! And YOU are a slave OWNER. THEY WILL DO ANYTHING TO WIN ELECTIONS EVEN IF IT MEANS PEOPLE LOOSING JOBS ! THE ECONOMY IS GOING THROUGH ITS WORST STRUGGLE IN YEARS AND PEOPLE WILL LOOSE JOBS IF WAGES ARE INCREASED ! Here is another utterly useless empty tin wasting taxpayers money….a UNZA fresh graduate can do a far much better job that this dull thing Joyce Simukoko who just sits in her office and farts all day long at our expense!! A useress tribal cadre of HH commenting on a positive plan of my government. Why don’t you just shut up at times? No doubt that there needs to be a decent minimum wage. The problem is that with the minimum wages comes leave days gratuity and all the rest. Its a burden on employers who are already taxed to the grave. Zambias labour laws need serious revision if they are going to be production oriented.